I was given a Kobo eReader for my birthday and yes, it’s definitely been keeping me busy! I was able to move my library of ePubs bought from the Sony Reader Store onto my Kobo eReader – it was something I could have done before on my iPhone, by moving the ePubs to the Stanza app, but I never got around to it before now. If you’re new to the Kobo eReader, or thinking of getting one, I highly recommend downloading the Calibre ebook management program. I was already using it to convert public domain PDFs from Project Guttenberg into ePub format, as well as converting my own WIPs into ePubs so I could do a first readthrough on my iPhone, but as it turns out, it’s a fabulous program for managing ebook content on the Kobo eReader; it’s a great way to selectively weed out the 100 classics that come preinstalled on the device. But the thing I really like about my Kobo eReader is that I can now read DRM-protected PDFs on the go! I have several of these, and up until now, they’ve been stuck in my “I’ll get around to reading them someday” pile because I haven’t been using my netbook very much, and I simply don’t like reading books on my desktop monitor. Mind you, it’s not perfect (and that’s a function of PDF as a format for ebooks, and not the device itself) – the reading experience depends on each individual PDF. With some PDFs, I can select an optimum font size and I’m still able to read each page in whole on the screen; other PDFs require me to choose either a too-small font size in order to fit an entire page onto the screen, or scroll back and forth. And let me just say, scrolling back and forth on a page (or up and down), is not fun. So DRM-protected PDFs are now (mostly) readable on the go. But when it comes to my preferred ebook format, it’s definitely ePub. I’ve been reading a fair bit on my new eReader. The funny thing is, I still prefer reading on my iPhone (which is why I’m holding out for an iPad for Christmas …). I’m Lexi Carmichael, geek extraordinaire. I spend my days stopping computer hackers at the National Security Agency. My nights? Those I spend avoiding my mother and eating cereal for dinner. Even though I work for a top-secret agency, I’ve never been in an exciting car chase, sipped a stirred (not shaken) martini, or shot a poison dart from an umbrella. Unfortunately, it turned out I was wrong – and this is through no fault of the book itself. It’s just that it isn’t a match to my taste as a reader. I’d been anticipating more of a thriller novel with a female genius computer hacking main character doing lots of extraordinary things, but No One Lives Twice is more of a romantic suspense novel, with two possible love interests (who are both referred to in the rest of the synopsis, so it wasn’t like I wasn’t warned), and the extraordinary genius computer stunts are performed by one of the love interests and a set of super-smart twins (so far, anyway – I’m on chapter 18 of 26). While it’s not really to my taste (I’m just not much into romance when it comes to books), there are lots of fun dollops of humor in it and the writing style is an easy read, so if romantic suspense is a genre you enjoy, you can check out the excerpt at Carina Press here. Hacking Timbuktu, by Stephen Davies, is a YA novel scheduled for release this coming November. I received my ACR courtesy of NetGalley and Clarion Books, and have just started reading it. Danny is a freelance IT specialist–that is, a hacker. He and his pal Omar are both skilled at parkour, or freerunning, a discipline designed to enable practitioners to travel between any two points regardless of obstacles. This is fortunate, because they’re off on an adventure that’s filled with obstacles, from locked doors to gangs of hostile pursuers. Together they follow a cryptic clue, find a missing map, figure out how to get to Timbuktu without buying a plane ticket, and join the life-and-death treasure hunt, exchanging wisecracks and solving the puzzle one step at a time. I am familiar with parkour, or freerunning, because it’s something my husband is interested in (and participated in, until he hurt his knee last year). It’s exciting to watch, and the pairing of it with the computer hacking is intriguing to say the least. So far, I’m on page 70 of 274, and Hacking Timbuktu is living up to its promise. What was the real-life location that inspired Michael Connelly to make Harry Bosch a Vietnam vet tunnel rat? Why is Jack Reacher a drifter? How did a brief encounter in Botswana inspire Alexander McCall Smith to create Precious Ramotswe? 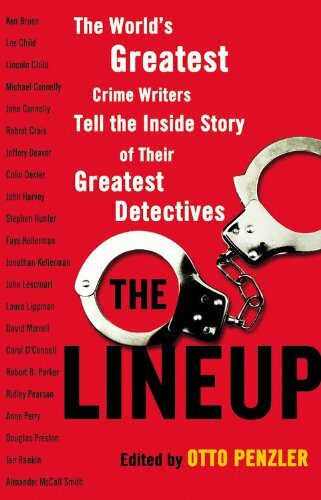 In The Lineup, some of the top mystery writers in the world tell about the genesis of their most beloved characters–or, in some cases, let their creations do the talking. If you find these questions interesting – and I definitely do! – you’ll love The Lineup. I’ve also discovered some mystery series that I’ve now added to my TBR list. As a writer, the essays in this book are especially interesting; it’s a peek into how a series character has developed, and absolutely fascinating from a writing point of view. The Element is the point at which natural talent meets personal passion. When people arrive at the Element, they feel most themselves and most inspired and achieve at their highest levels. With a wry sense of humor, Ken Robinson looks at the conditions that enable us to find ourselves in the Element and those that stifle that possibility. Drawing on the stories of a wide range of people, including Paul McCartney, Matt Groening, Richard Branson, Arianna Huffington, and Bart Conner, he shows that age and occupation are no barrier and that this is the essential strategy for transform­ing education, business, and communities in the twenty-first century. I’m really enjoying reading the various stories of all the different people in the book; the rest of the material isn’t quite as interesting, as it simply reinforces what I already know to be true. But it’s fun learning things like the fact that Elvis Presley didn’t make his high school glee club because the director of the club thought Presley couldn’t sing! This entry was posted in Books and Reading, Reviews and tagged action adventure, Carina Press, Clarion Books, flash reviews, Julie Moffett, Ken Robinson, mysteries, NetGalley, non-fiction, Otto Penzler, romantic suspense, series characters, Stephen Davies, writing process, young adult on August 30, 2010 by Belle Wong.